The following summer after arriving in New Mexico. Kids are off to camp. This is part of a series of essays about ‘loving’ New Mexico and yes, it is memoir—since the reason I loved this place for so long is because of how I lived my life here, so it is impossible to separate the love from the life. Even though the landscape, however harsh, however magical, plays a role in my relationship to this state, still it is really about how I became whoever I am (for better AND worse) in a particular place (New Mexico) and time (70s and 80s). A previous post was about being a young air force wife on Holloman AFB, commuting to college at NMSU, and gaining some modicum of political awareness. All heady stuff but it did not make me a real part of New Mexico (air force bases and college campuses are not really part of a place—they’re their own worlds). The following then is more about the how rather than the where of a life being lived. Back in the spring of 1972 I completed student teaching at Alamogordo Middle School, received my BS degree in Secondary Ed/History, and Don got orders for an overseas assignment where I could not go. What to do? We owned a small travel trailer so the kids and I moved to my mom’s Minnesota backyard for the summer. I sat over endless cups of coffee with a U.S. map in front of me trying to decide whether I wanted to live back east in North Carolina or in the southwest where I now felt more at home. Late summer I packed up the kids and I’m sure a dog or two and headed west, the decision made except whether it would be Phoenix where my best friend Sue lived or New Mexico which was more familiar. We drove to Phoenix. I hated it. 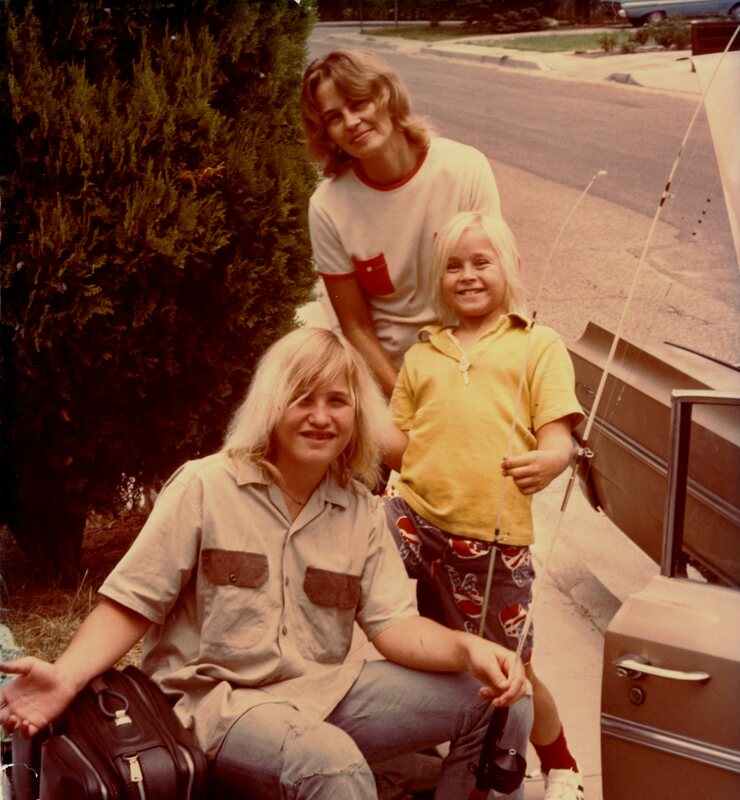 Years later Scott and Steve told me they desperately wanted to stay because at least they knew two kids there, Kim and Pam, Sue’s girls, and they really did not want to go to a totally strange place. I was blindly unaware of their anxiety I am sorry to say. I feel the need to endlessly apologize to them for not making their needs a higher priority—I thought that as long as they were (relatively) well taken cared for, loved and had some favorite stuff they would be okay. And ultimately they were…and are. In a strange way it has all worked out to the advantage of my grandchildren because, based on their own experiences, their parents have been determined to let them live out their school years in one good home in one good neighborhood in one good school district. I tell myself that if I hadn’t been so restless and had instead made sure my kids had a stable childhood who knows if they would have felt the same necessity to keep chaos out of their kids/my grandchildren’s lives! But back to the story: After Phoenix we drove to Alamogordo and it turns out none of us wanted to be there—although New Mexico DID feel right! North to Albuquerque it was. I rented a cheap motel room on Central and, before I could even think through the Albuquerque possibilities, a call came from Farmington, New Mexico (in those pre-cell phone days tracking me down in an Albuquerque motel was no easy matter) offering me a position teaching history. It was almost time for school to start so, they said, I needed to come up immediately to be interviewed and fill out the paperwork. I truly had no time to think. The next day Scott was sick so I left my poor 12 year-old under the watchful eye of the (hopefully) trustworthy motel manager (who would risk that these days?) and 9-year-old Steven and I drove to Farmington. A successful day. Quick interview, accept the position, sign the paperwork, head back to Albuquerque for the night, get Scott and tomorrow move to our new home. Sounds good doesn’t it? I had just been offered a position in the profession I had studied four years to enter. I would have a stable income. My husband would return from wherever, and I would either stay in Farmington (the marriage was not excellent by then) or go with him and take another position, now as an experienced teacher. The next morning I called the principal in Farmington and turned down the job. Professionally that was extremely dumb since history teachers were not in big demand even back then…unless you could also coach something. My kids were okay with this I guess…what choice did they have. I mean I wasn’t a bad mom exactly…I did love them, talk to them, feed and clothe them, provide them with a reasonable amount of goodies, worry about them, want the best for them…I just didn’t know who the hell I wanted to be when I grew up…which is very hard on kids. Still I rationalize that they are better parents for all of that! You know Barack Obama’s mom wasn’t so different, just had her sights set a little higher…on the whole world instead of North Carolina versus New Mexico. Which is why he’s a great dad and no-drama Obama—all because his mom wasn’t a vegetable-cooking church-going stable super-mom! However If she were alive today I’m sure she would still be apologizing… “You know he would have quit smoking sooner; be happier/more relaxed/tougher on Republicans; not be such a smarty pants if I had just been a better mom…” Fortunately my sons are pretty much perfect so… This might be a test to see if they’re reading my blogs. In Albuquerque the next day I went house-hunting, registered my kids in Bandelier Elementary and Jefferson Junior High, and decided while I was looking for a job I would volunteer somewhere…the McGovern for President Campaign perhaps. And that my children is how we became New Mexicans.